If true, the per-room price for the 188-room hotel would be $505,000 - the highest, Crain's says, for a Chicago hotel. Zell apparently expects to lift the hotel's value by bringing in Hilton to manage it and market it to its millions of customers. The owner of the hotel, which opened during the recession two years ago and still isn't making money, wanted to keep the property but couldn't find an investor to replace the one that wanted to sell its share, Crain's says. The article says that a Hilton spokesman declined to comment, as did a Zell spokesperson. Crain's couldn't get in touch with David Pisor, the hotel owner who had hoped to turn "Elysian" into a hotel brand. The Waldorf Astoria Chicago is about a five-minute walk from the Park Hyatt and Peninsula hotels. It's part of a 60-story tower that has 51 high-end condominiums and one Michelin-star restaurant, Ria. 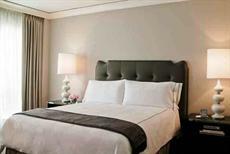 The Waldorf Astoria Chicago's suites start at $525, Crain's says. Readers: Have you been to the hotel, even if just to have a cocktail in the bar or eat dinner at one of its two restaurants?